We kicked off the ManageWP.org project back in 2013 as a way of giving back to the WordPress community. Iinitially we had a single goal – to help discover best blogs and WordPress bloggers out there – but once we released the Plugin Discovery Tool we decided to focus on giving the community more awesome tools that would bring the community closer together and help people make smart choices. 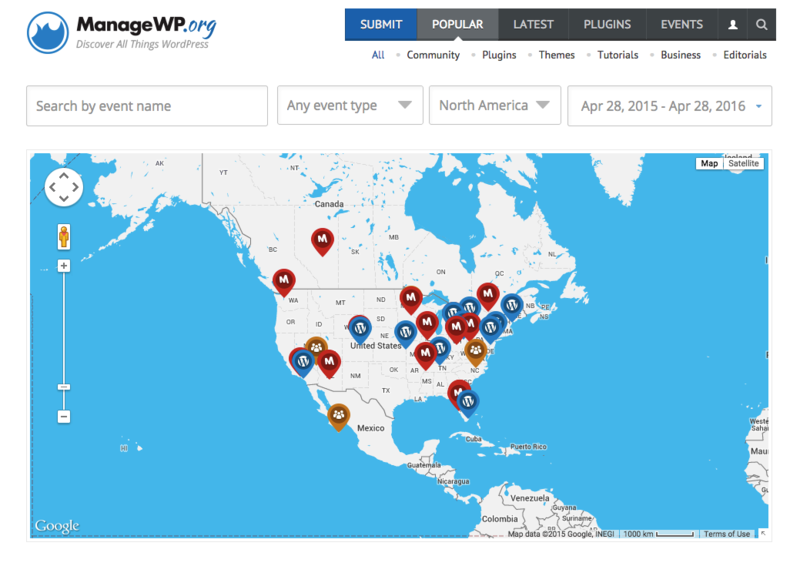 Today I am honored to announce the launch of the WordPress Events Hub! When you visit our new Events Hub, you will see by default which WordPress events await you on your continent in the next 12 months. After we’ve created the WordPress Events Hub, I was very excited to look at the map and see the result of our hard work. We plan to include the option to Tweet about particular event directly from Events Hub page. We’re considering adding speakers’ Twitter accounts as well, so you can easily find and follow them, as well get directly in touch with them. The entire project is envisioned to involve the WordPress community, so you if you are already a member of ManageWP.org and you have posting privileges, you can easily create a new event. If you are an organizer of an event which is already displayed, you can send us an email to hi@managewp.org with your information and ManageWP.org username so we can assign the event to you. Great work! – I am new to Manage_WP, live in Southern California, Palm Springs area. Would like to start a Meetup group out here, the last one never took off, but as I clear my schedule will give it a whirl. WordPress community needs more people like you! Hopefully our event tool will help bring more people to your meetups.